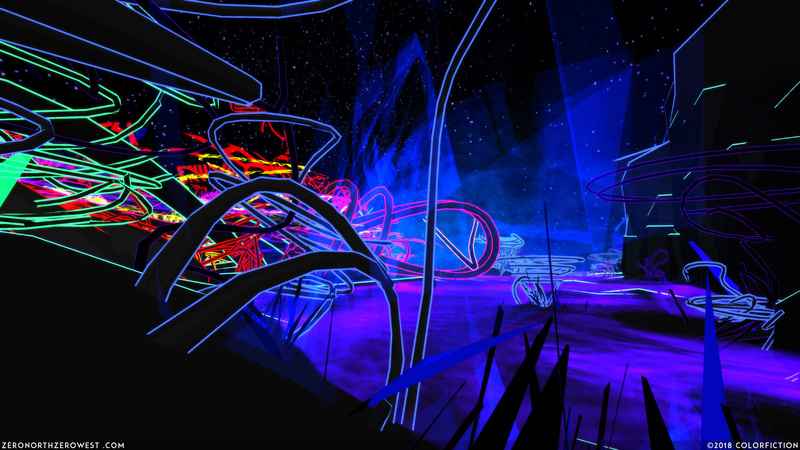 ZeroNorthZeroWest(0N0W) is a first-person relaxing exploration game from Colorfiction. Take a trip and open your mind. 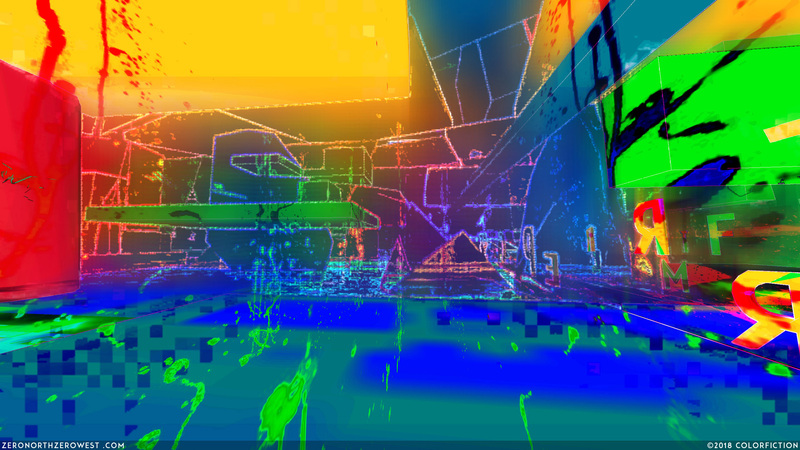 0°N 0°W (ZeroNorthZeroWest – 0N0W) is a first-person relaxing exploration game. It is gameplay distilled to its essence with the sole objective of exploring beautiful environments. It’s an entirely non-linear experience through multiple open worlds where everything you see is accessible. There is a randomized level progression system that provides a different journey each time you play! 0°N 0°W is also a peaceful adventure apt for all ages. 0°N 0°W started out as Dream.Sim, an itch.io project back in 2015. The initial look and style were inspired by Disney’s classic Tron movie and CAD drawings. The minimal design was greeted with a good reaction from the community and so was a Steam Greenlight campaign. The project has been unleashed on the public twice over the past couple of years. First, it was exhibited at the Children’s Museum of the Arts New York City Video Game Expo of 2016 and secondly here in the UK at the EGX’s Rezzed Zone in 2017. The “gameplay” is very much in the arthouse/ installation/walking sim camp. It’s not a game per se. Four-way movement and jump key are the only inputs. The player is free to walk about the environments and take in the views. There’s no time limit or narrative, it’s a pure audio /visual experience devoid of any game like systems or structure. 0N0W is an interactive take on a meditative experience. The gaming equivalent of Koyaanisqatsi or the classic end sequence of Kubrick’s 2001. It’s an audio/visual presentation where the viewer can get lost in the riot of colours, textures and shapes. This, in combination with an ambient soundscape, featuring drones, found sounds and pulsing scales and arpeggios. The opening sequence reminded me of Jalopy. You appear beside a low poly car against the backdrop of single street townscape. The only highlight being neon-lit cinema, you enter the foyer and around the reception counter, there is another door and corridor leading to the cinema auditorium. I headed towards the big screen. Fade to white. Next, I was presented with infinite doors which reminded me of the famous Interstellar bookcase clip. Each door leads to a new vista. 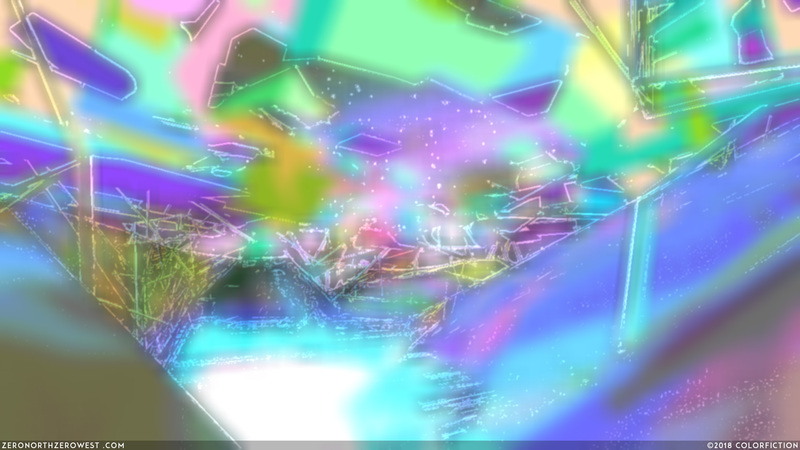 Each scene is segued by a fade to white and hyperspace jump type vector graphics. Some jumps transport you to a low poly apartment replete with bed, study, and lounge. The only constants appear to be a clock and a tv, which shows yet more textures and palette sifting colours. 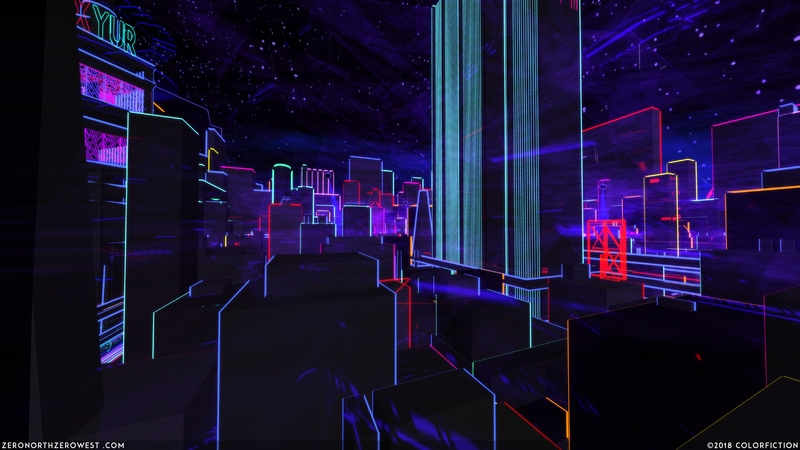 One scene allows access to a balcony where you can gaze out at a Tron-like vectorscape, replete with neon glowing edges. This echoes the famous Blade runner sequence where Deckard stares out from his apartment veranda to take in the night air. Some scenes remind me of near to death GeForce card glitches, all sharp flickering vectors with no vanishing point or logic. Others are more calming pastel coloured vistas of floating amorphous shapes and cumulus clouds. Apparently, every session can conjure a random scene. However, I’ve found from repeated viewings that a few scene structures/prefabs are more prominent albeit with a different texture /colour scheme or treatments. The loft apartment, ranch and “Tronscape” pop up regularly. My favourite scene, and one I kept returning to during my review process, can be found on the menu, where there are 40 preset experiences for you to choose. It’s like a brutalist recreation of Monument Valley set to a Jason Pierce drone. The natural sandstone buttes have been replaced by looming primitive shapes. Multiple layers of almost opaque parallax triangles replace the usual cloud formations, slowly drifting across a pale blue sky. The scene is vast and open, allowing the viewer to wander at their leisure and take in the awesome vistas from any vantage point. I haven’t tired of its wonder after many nightly visits. Controls are mouse/keyboard which offers a great deal of precision when navigating the space, perhaps too much though. I greatly prefer using a gamepad as its flowy natured fits the overall experience better. From a technical standpoint, 0n0w doesn’t tax any of my systems. In fact its one of the few titles where I’ve had to limit the fps to 60, as I’ve found the keyboard controls too sensitive at higher frame rates. The options for the game are pretty minimal. The standard Unity popup start box is the only place to alter the graphics settings. These are limited to resolutions, texture size and anti-aliasing standards. Whilst running the title, you can only tweak the sound settings and there are only two options: music level and overall volume. This is a pretty poor show and considering one of the core aspects of the “experience” is the audio, I’d expect more sliders for the many layers of drones, field sounds and samples. From a technical level, low poly vectors and basic geometric shapes are the principal assets. These are overlaid with various palettes from classic neon lighting to more subtle sepia and grayscale colour gradients. Blur and TV static FX also make a show. Various tracers trails and sprites add an extra dimension to the proceedings. There’s no factual or real-world imaginary aspects apart from the basic building prefabs and cityscape lettering. The soundtrack is a mixture of ambient drones, evoking Tangerine Dream’s Rubicon era on Virgin Records. Deep pads and filter passes. Other more atonal passages hawk back to Brian Eno’s series of experimental works on EG. For anybody who seeks out this calming and contemplative genre of music, there are lots to dig into. Apparently 7 hours worth according to the press blurb. All these drones and bubbling analogue synth scales are melded with layers of traffic, wind, ocean waves and street bustle samples linked to the current scene and placement. 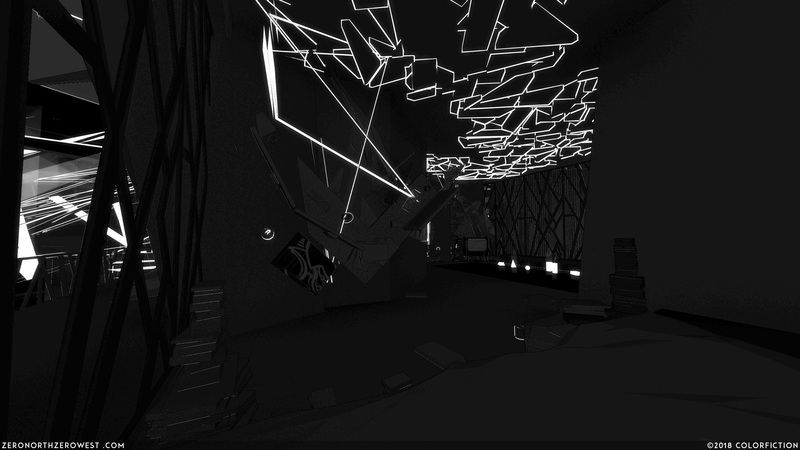 This immerses “the player” into the space. As a standalone art piece that stands alongside the likes of Brian Eno’s 77 Million Paintings its a perfectly serviceable product. But as an interactive toy, it falls well short. The minimal options and basic UI elements are bare bones. More control options and individual sliders for all the audio layers would enhance the experience. A no-hands flyby mode and the ability to instantly change palette, textures and vector maps would also be a good addition. Saving favourite scenes and coordinates would also add value. Of course, all the above would mean more development time. Whether the title is content locked now is up for debate. Colorfiction have announced plans to bring the product to “multiple platforms” in the future. To critique such a polarizing product is hard. To take it as an art installation and interactive museum work, It stands on its own merits and does the job. But in the Steam marketplace, it has to contend with other titles such as Rez Infinite and Polynomial, which offer credible alternatives as a light synth or meditative experience. I enjoyed my time in the worlds that Colorfiction have created. For anyone with an open mind its well worthy of a look.